Cinco de Mayo appears to be celebrated more throughout America than it does throughout Mexico. The day is to honor the victory of the Mexican army at the Battle of Pueblo. It's a celebration of heritage and pride. So in keeping in the theme of this American-celebrated Mexican day I decided to make a tostada that resembles Mexican food but clearly has an American thread to it. The Italian sausage, green chili and white bean flavors are a fun spin on a traditional beef and black bean version. The roasted artichokes finish the combination with an unexpected intense sweetness. Definately serve this with a salt-rimmed margarita or a Mexican beer. And no matter what your nationality, celebrate your heritage today... and be fat and happy proud. Make the bean spread first, set aside and keep warm. 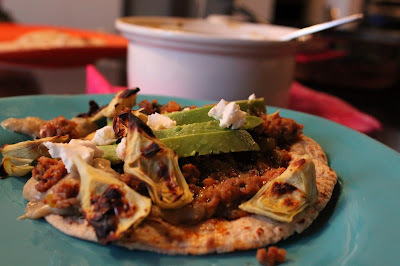 Roast the artichokes and toast the tortillas while creating the meat filling. 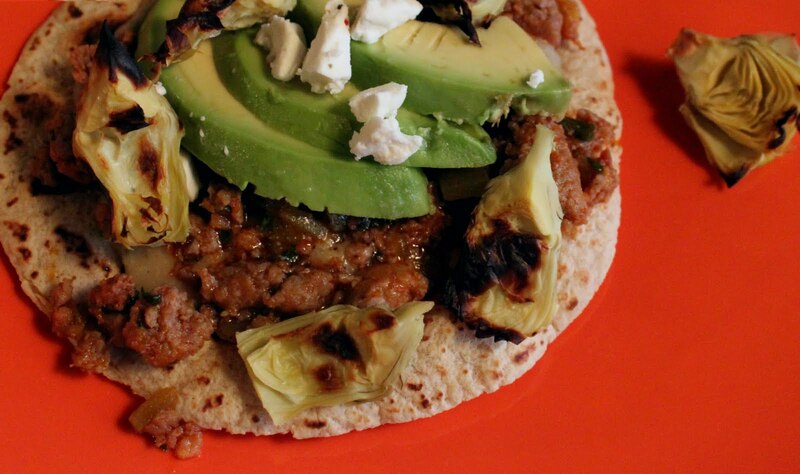 Have the avocado and goat cheese ready, then put it all together and enjoy immediately. Sautee the onion and celery in a bit of olive oil until they begin to soften. Add the garlic, the jalepeno and the white beans. Continue to sautee for about 5 more mintues to allow the flavors to meld and everything to soften. Add about 1/4/ cup of water, broth or white wine as the pan begins to get a little dry. Carefully pour the ingredients into a mini cuisinart (or blender). Allow to cool slightly, cover the blender with a towel to shield yourself from any hot splatters and then blend into a puree; again adding a few tablespoons of water, broth or wine to thin it out. Cover and set aside but keep warm. Drain 1 can of artichokes; turn on the oven broiler to high. Line a cookie sheet with tin foil and spray lightly with Pam. 1 small can Green Chilis with juice (if you have a fresh green chili, chop it small and add to the sausage sooner. Remove the casings from the sausage, crumble into a sautee pan and cook over medium heat, breaking up any large sausage pieces with a wooden spoon. Add in the chorizo if using. Just before the sausage is ready, add in the green chilis and everything meld together. To toast the tortilla- either place under the broiler until the top side is crispy and then flip over and repeat on the other side. Or toast in a dry pan until the bottom is crispy and then flip and repeat. 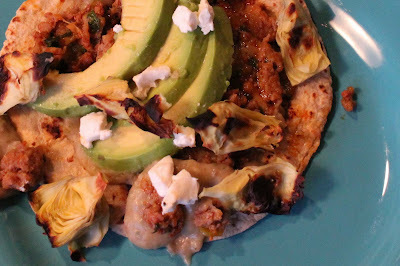 Lay the tortilla on the plate, smear the tortilla with the pureed white bean mixture. 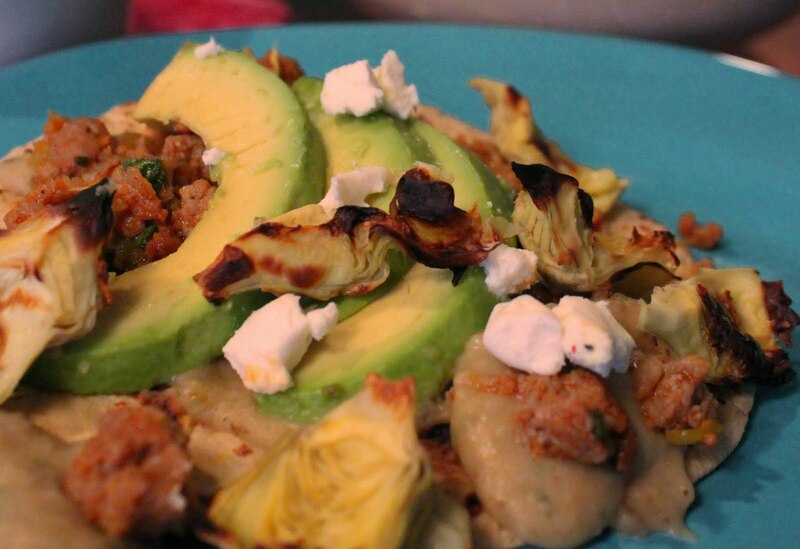 Cover the beans with a large scoop of the sausage mixture, a couple of avocado slices and a handful of the roasted artichokes. Sprinkle with goat cheese and serve immediately.